2012 will see Birmingham’s Children’s Hospital celebrate its 150th birthday. On June 25th 1861 Thomas Pretious Heslop (1823-85), a physician who had joined Birmingham’s Queen’s Hospital in 1853, held a private meeting of hand-picked individuals to propose a new Children’s Hospital. At a later public meeting the governors of the Queen’s Hospital denied the need for such an institution, but the resolution was passed and founded on the principles in the image above, opening the next year. Originally situated on Steelhouse Lane, in 1867 the Birmingham and Midland Free Hospital for Sick Children opened a building on Broad Street, taking over the building of the Lying-In Hospital and Dispensary for the Diseases of Women and Children. Free admission was qualified by means testing, so that those who could not afford to pay were looked after. Funding for the hospital proved difficult, with an 1886 appeal needed to keep one of its wards open. In the appeals leaflet the hospital claimed to have relieved 14,000 patients in the last year alone. 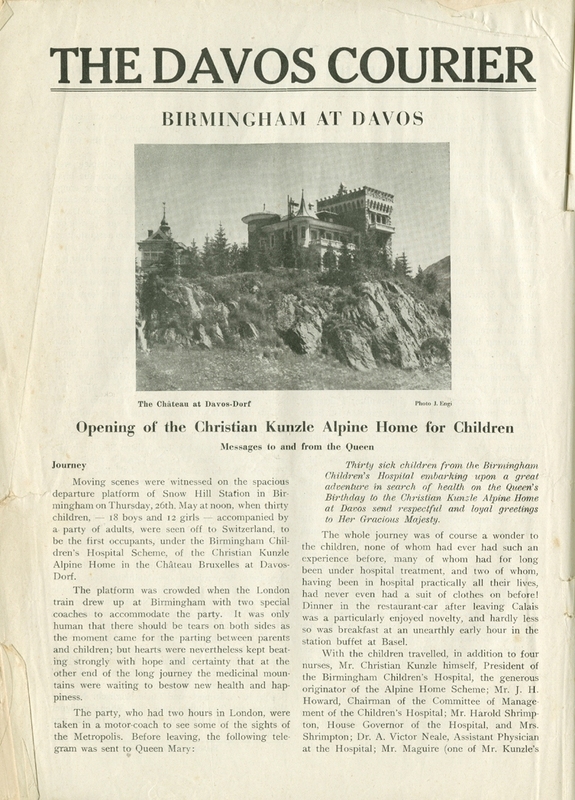 The initial plans for a move were agreed in 1908 as space became an issue, although the move to a new children’s hospital building was not even started until 1917. 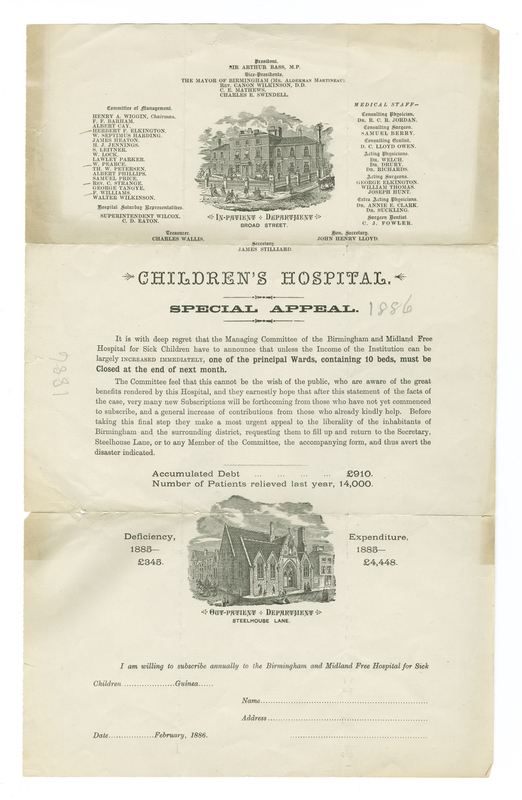 In 1913 a Children’s Hospital Brick League was set up to help fund the new building. Any child who gave one guinea could have their initials cut into a brick, and attended a brick laying ceremony for it at the hospital. The onset of World War I slowed the movement of the project, and the first patients arrived with little fanfare to an unfinished building in 1917. The finished building was visited in 1919 by King George V and Queen Mary. In 1998 the hospital returned to Steel House lane and occupied the former General Hospital, renamed the Diana, Princess of Wales Children’s Hospital. Birmingham Archives & Heritage holds the archive for the Children’s Hospital. Appointments to view material can be made via email at: archives.appointments@birmingham.gov.uk or by telephone on 0121 303 2468. Birmingham Archives & Heritage holds the Bournville Village Trust Estate archive, MS 1536. In the 1920s George Cadbury (1839-1922) compiled a pamphlet titled ‘Suggested Rules of Health’, which was given to every new resident of BournvilleVillage. 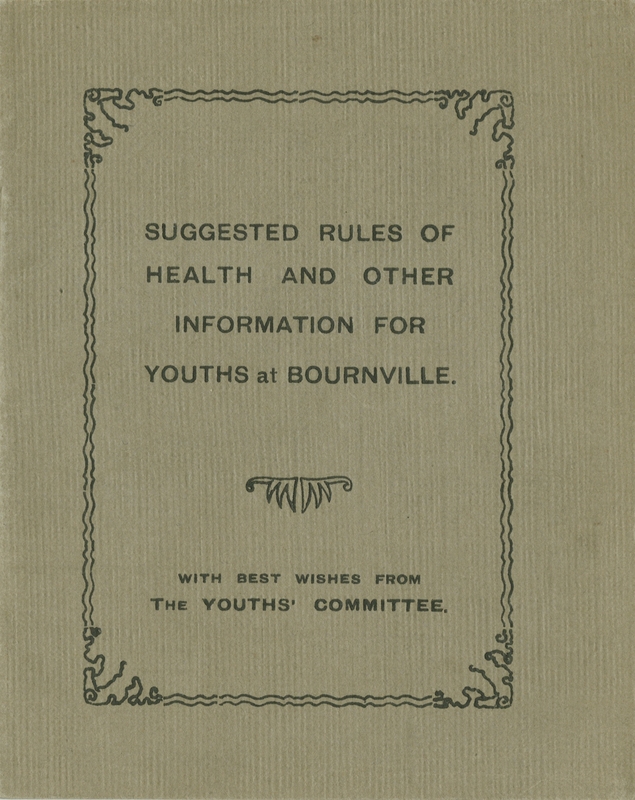 The pamphlet you can see here, ‘Suggested Rules of Health and Other Information for Youths at Bournville’, 1924 (MS 1536, box 5), was based on Cadbury’s original publication but was given to every youth under 21 years of age who worked at Bournville. Every morning take a cold bath. To breathe is to live. To breathe deeply is to live a healthy life. Aim at reading good books. If you frequent the picture palace or theatre, remember that yours is the responsibility to decide whether it is beneficial and instructive or degrading or harmful. What rules of health would you suggest? !